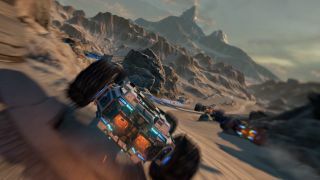 The Rollcage-like racer is still in early access. That's not how you spell contact—not even close—but as this new trailer for topsy-turvy racing game Grip demonstrates, the work of musician Full Kontakt fits the early access game like a power glove. We've previously seen the Rollcage-like racer put to the music of Strauss, but as Strauss' appreciation for futuristic driving games remains lamentably unproven, the high-tempo wubwubs of Full Kontakt do seem more at home. Grip was on Kickstarter, and then it wasn't, and now it's in early access—it's a tale as old as time. But by all accounts people seem pleased by this Rollcage spiritual successor. The full game should be done by the end of Spring 2017, but if you can't wait till then, there's a small discount in the ongoing Steam Winter sale.